Staling is a major problem in the baking industry. Staled bread and cakes have undesirable qualities, like a dry, crumbly interior and a loss of flavor. Many plant personnels insist that moisture loss during storage is the main factor contributing to crumbliness of the crumb. While moisture loss is the popular belief, staling is caused mainly by starch retrogradation. There are plenty of theories that surround staling. However, the available enzyme solutions in the market currently targets the mechanism of starch retrogradation. When starch molecules recrystallized over the shelf life of the bread, the crumb becomes crumbly and leathery. IBIS™ Green is a clean label conditioner that would help improve dough performance and volume. We used it because we wanted to show how a clean label emulsifier would affect the performance and shelf life of our bread. *specific volume was measured by BVM – L370 from Perten Instruments. As compared to control, IBIS™Green reduced the mixing time by 10 sec. 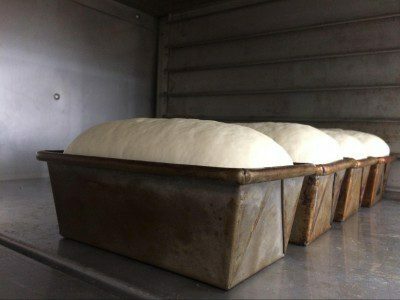 It improved the flow and fluidity of the dough, as expected of any emulsifier, and therefore provided bread with higher volume. These mechanics itself resulted in a softer bread at Day 1. Since IBIS™Green is not a shelf life extender, it did not prevent staling. However, it did produce a softer bread via a higher specific volume, and that resulted in an overall softness as compared to the control sample (see table 2). We experienced an increase in firmness over 4 days with both the samples. For this experiment, we used a straight dough method with an hour fermentation time to make the 200 g pup loaf of bread. After cooling for 30 mins, at an internal temperature of 100 oF, we packaged the bread and kept it at room temperature for 4 days. We used the Brookfield CT3 Texture Analyzer to perform a TPA with an acrylic cylindrical probe 1.5”probe TA4/1000, and the settings used were the target value as 5.0 mm for a #18 slice. The trigger load was 10.0 g and test speed was 1.00 mm/s. Analysis for the TPA texture attributes was performed using the TexturePro CT V1.8 Build 31 software. The specific volume is measured by BVM-L 370 laser topography volume analyzer from Perten. On day 1, the moisture for both Control and IBIS™ Green was not significantly different. We stored the packaged bread sample at room temperature for 4 days, after which the moisture did not change significantly either. However, we saw a significant increase in bread hardness increased from Day 1 to Day 4 between the two samples. Therefore, we concluded that bread staled in the absence of moisture loss. What is in IBIS™ Green that created a softer bread? IBIS™ Green is a blend of enzymes with ascorbic acid. Ascorbic acid is an oxidant which promotes dough development by strengthening the gluten. Together with the enzymes, this allows for the gluten to function better, which lead to greater loaf volume and resiliency. We did not observe any moisture loss with the hardening of the crumb. You can create a softer product through increasing the volume of your product. You can increase the volume of your product through clean label conditioners like IBIS™Green that strengthens the gluten network of your dough. Staling is due to other mechanisms within the crumb. In our research, it is not associated with moisture loss.